One of my favorite things about fall are winter squashes. Since it is officially fall now I would like to share my delicious stuffed acorn squash recipe with you. Acorn squash is one of my favorite squashes. It is so simple to prepare and tastes oh so good. I used to not like fall and even get depressed when the days started getting shorter and the cold started creeping up on you. This year I noticed that I don’t feel that way. I think it is because I started eating local and seasonal food. Now I am really looking forward to the different seasons, which comes with a lot of the foods I haven’t made in a while. Most of those fall foods are based on winter squashes. The one important thing when preparing stuffed acorn squash and squashes in general is, that you need a good knife. The toughest part is to cut the squashes. It will make your life a lot easier and safer if you have a really good quality knife. I used leeks and mushrooms paired with ground beef for the sauce. Since I am dairy free I use coconut milk as my base. Feel free to exchange that to any other creme type if you don’t like it. I noticed that when you add a lot of veggies, garlic, onions etc to a sauce, it does not taste like coconut anymore. There is a little extra treat that comes with this recipe. If you can tolerate seeds, use the ones inside of the squash and roast them. Simply place them on a baking sheet, cover them with 1 tsp olive or avocado oil, season with salt and bake in the oven for 10 minutes. Toss them around after 5 minutes of the baking time. They are so delicious! Enjoy the change of the season with this warming and grounding fall recipe. This delicious stuffed acorn squash recipe is the perfect hearty winter dish. It features healthy ingredients such as leeks, mushrooms and it is dairy free. Preheat oven to 350 degrees. With a sharp knife cut squash in half and scoop out the seeds until the inside is smooth. Score the inside in a crosshatch pattern approximately half an inch deep. Bake for approximately one hour until the inside is soft. 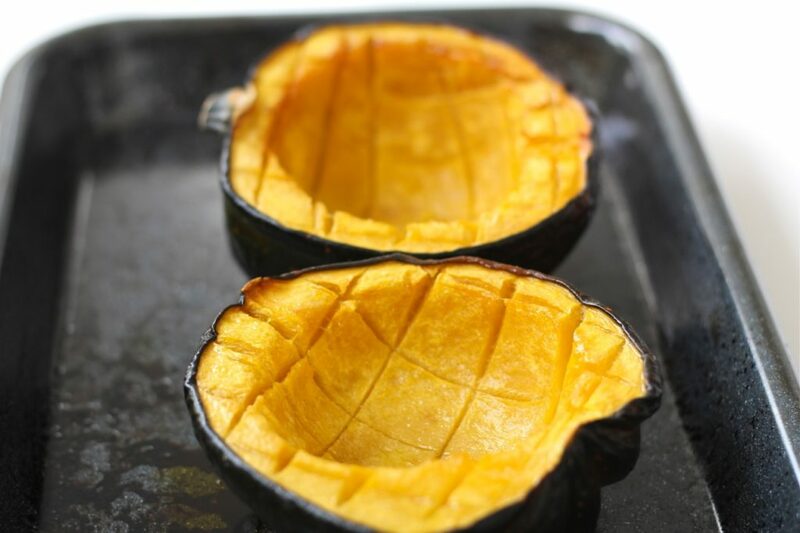 After half of the baking time, spoon the olive oil from the center of the squash over the dryer parts. In the meantime wash and cut leek and mushrooms into small pieces. Peel and mince garlic. Heat avocado oil in a large skillet over medium heat until hot. Fry garlic and leeks for a few minutes. Reduce temperature to medium-low and add the mushrooms, season with salt and pepper and fry until golden brown. Push the veggies to the side of the pan and add the meat. Increase temperature to medium and cook until brown throughout. Add coconut milk and bring the sauce to a boil for a minute. Stuff Acorn squash with sauce. Roast the seeds by placing them on a baking sheet, covering them with 1 tsp olive or avocado oil, seasoning with salt and baking in the oven for 10 minutes. Toss them around after 5 minutes of the baking time.